This is one of those little films that you don't expect much of, but are blown away by. I was lucky enough to be invited to an early screening, and loved every second of it. 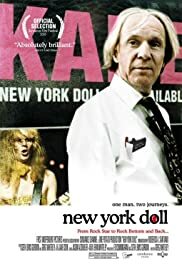 "New York Doll" is a great movie that surprised me with the amount of heart it had! I did not even know who the New York Dolls, were, and yet I left a fan, and even more, a fan of Aurthur Kane. Aurthur is such a loving, warm, funny, unique person that he just draws you in. He makes you love him, and makes you want to be his friend. There are so many great unique, funny moments in this film that just could not be written. This movie has a great message, and is wonderful for the entire family, which is so rare. I loved this film, and recommend it, to anyone! Go see it! Search for it, find it.